Jukebox booklets are a stylish and professional package for your information, portfolio or writing. Show off your photography or design work the right way through our superior print service and high quality materials. Nothing beats the feeling of seeing your work published in a premium bound book - we’ve created everything from cookbooks and children’s books to technical instruction booklets and high-end portfolios. We offer different sizing and binding options to suit all needs. Choose between uncoated stocks with natural texture, or premium coatings with modern finishes; We even offer thick cardstock options for stronger, more durable covers and pages. Order Jukebox booklets for all of your creative projects, including catalogues, magazines and calendars. Order as little as 50 booklets or choose offset output for your large quantity projects. We’ve got everything you need to create the next chapter in your business. Order your custom booklets in Vancouver today. Brand your business with custom coil booklets. Coils come in various sizes. Jukebox booklets are a stylish and professional package for your information, portfolio or writing. 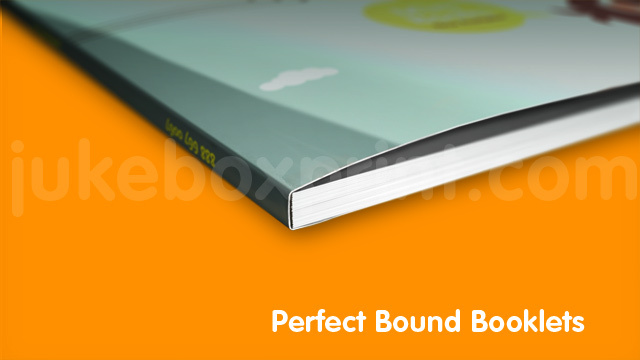 Perfect Bound Booklets are Classy! Suited for booklets with higher page counts, Perfect Bound Booklets speak class, quality and professionalism. Perfect Bound Booklets are perfect - for housing beautiful designs for your portfolio or any business looking to showcase products or writing. Cookbook printed with 10pt silk cover and 100lb text inside pages. Looking for a unique size or even shape? We can produce anything you can imagine with various coatings. Request your custom quote today. Can I do a full bleed cover on my Booklet? Will the spine show cracking? The amount of cracking that occurs depends on the type of binding, coating and and/or the colours of your design. The covers of our Booklets (and Calendars) are scored along the spine prior to binding to avoid cracking of the ink along the spine and folds. Do I need to adjust my Booklet for creep? See: Press-ready files for Booklets. No, your booklet files will be adjusted for creep during our prepress processes. Do I need to imposition my Booklet files? Please supply your design files as single pages (not spreads or imposed) in one PDF. See: Press-ready files for Booklets. No, your booklet files will be impositioned during our prepress processes. We recommend a safety margin of 0.625 inches away from the spine of the booklet. 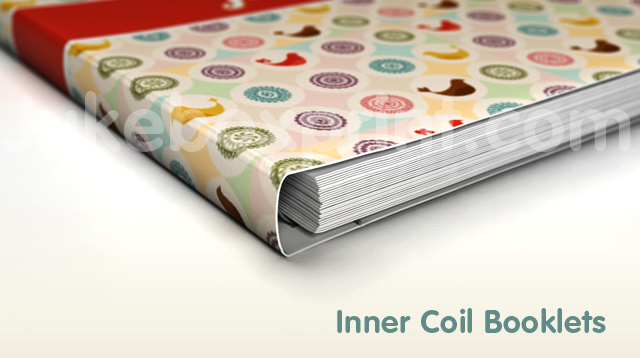 When designing a coil bound booklet, it is important to consider the placement of the coil binding. The spine width is generally about 3-5mm but will depend on the number of pages, as well as the how thick the paper is – generally 3-5mm. If you are ordering a perfect bound booklet and need to know the exact spine width, please contact us and our production team will calculate the spine width for your order. When designing your booklet, you can have a wrap-around cover. This cover will need to have allowance for a spine. On what side are Booklets bound? We can also bind on the short side (additional costs may apply). If you would like to order a booklet bound on the short side, please submit a Print Quote. Our Booklets and Calendars are generally bound on the long side. How many pages in a calendar? Front Cover (1 page), 12 double-page month spreads (24 pages), double-page year overview (2 pages), back cover (1 page). A coil bound calendar can have as little as 14 pages. All pages are counted when bound, including the cover. The cover (including inside front cover, inside back cover and back cover) counts as 4 pages. 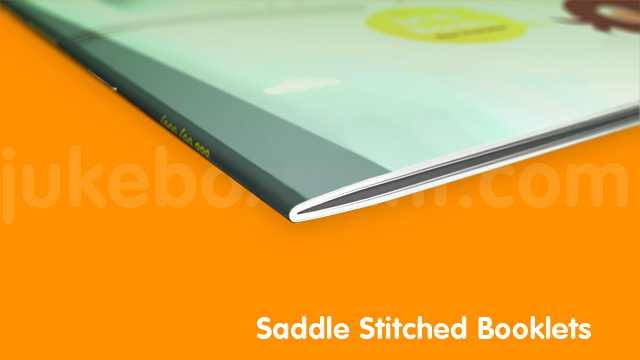 Standard saddle-stitched booklets are produced by folding multiple sheets of paper in half and then stapling in the centre. As an example, one flat 17" x 11" sheet saddle-stitched to an 8.5" x 11" booklet would count as 4 pages. Using the same example, if two 17" x 11" sheets were saddle-stitched, the result would be an 8.5" x 11" booklet with 8 pages. Saddle-stitched booklets must have a page count that is a multiple of 4. 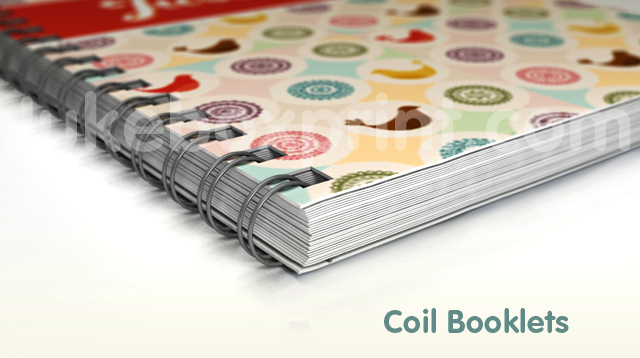 Coil and perfect bound booklets must have a page count that is a multiple of 2. Coil and perfect bound booklets are simpler to calculate as no folding is required – single sheets, with 2 sides or pages per sheet, are bounded together resulting with an even page count. For example, seven 5.5" x 8.5" sheets coil bound on the left-hand side will have a total of 14 pages. Perfect bound booklets are produced by wrapping a four-page cover around single sheets of paper and gluing them at the spine. If you are placing an order for booklets, it is important to know how we calculate the number of pages to place your order correctly. Margin / Safety Margin (inside): at least 0.5"
Margin / Safety Margin (top, bottom, outside): 0.125"
Page Count:includes all sides of the final booklet (when closed and including the cover). For example, an 8 page booklet consists of a 4 page cover and 4 inside pages. See: Perfect bound booklets: spine width.